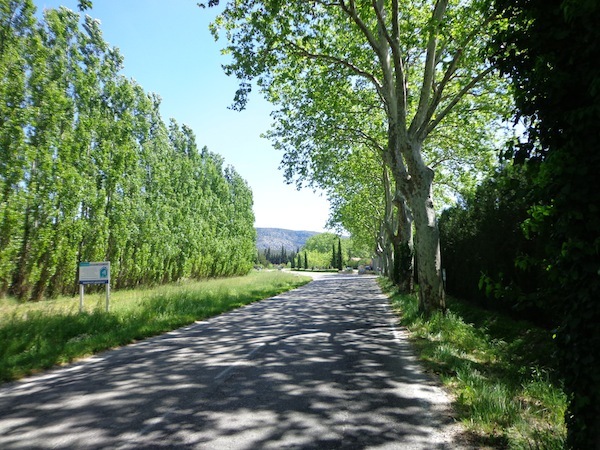 The backroads of Provence. Wildflowers. Blue skies, bright sun, a cool breeze in my face. This was my cycling dream. 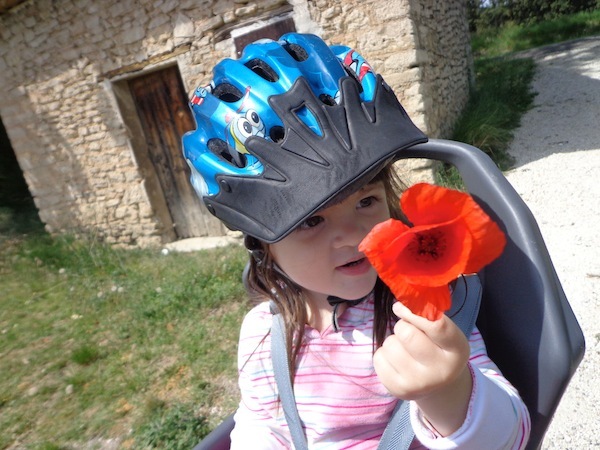 It was supposed be a month-long family cycling and camping holiday, taking us from Marseille in France to Geneva in Switzerland, along the Rhone Valley. But the French government refused Darling Man a visa, and the dream almost died. 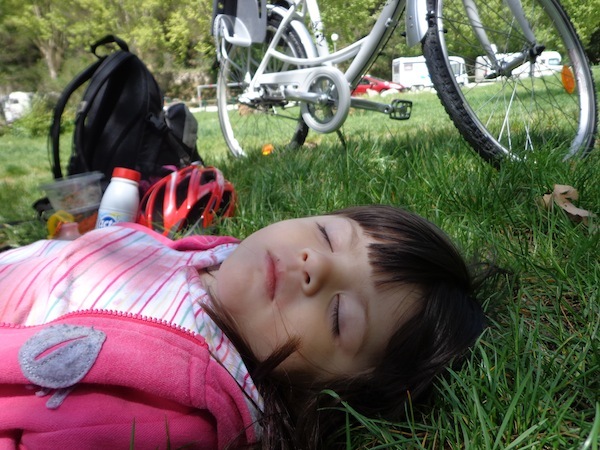 I didn’t feel confident enough to attempt a cycling and camping trip as a solo parent. The responsibility of keeping a two-year-old safe on the roads and in camping grounds just seemed too much. So our long-planned trip underwent some radical changes. But I was determined to catch a piece of my dream of cycling in Provence. And so, in the beautiful village of L’Isle Sur La Sorgue, my cycling dream was distilled into just one day. And it was so close to being perfect. 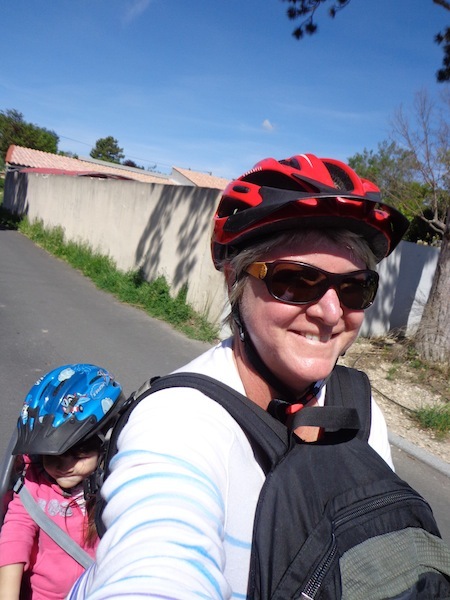 Loaded up with picnic provisions, Miss M and I set off on a rented bike, bound for Fountaine de Vacluse. From our fabulous camping ground in L’Isle Sur La Sorgue to “the source” of the Sorgue river was about 16 kms, a lovely easy day trip. As happy as I was to finally be cycling through Provence, the day was tinged with the sadness of doing it alone, without my Darling Man, who would have loved the sky, the clouds, the flowers and the river as much as I did. As I pedalled along a quiet backstreet in Provence, I suddenly felt the bike give that familiar wonk. Unbelieveable – Miss M had fallen asleep in her baby seat. I pulled in at the first available pulling-in place. And it was too beautiful to be believed. The river was so clear I could see the pebbles in the riverbed. 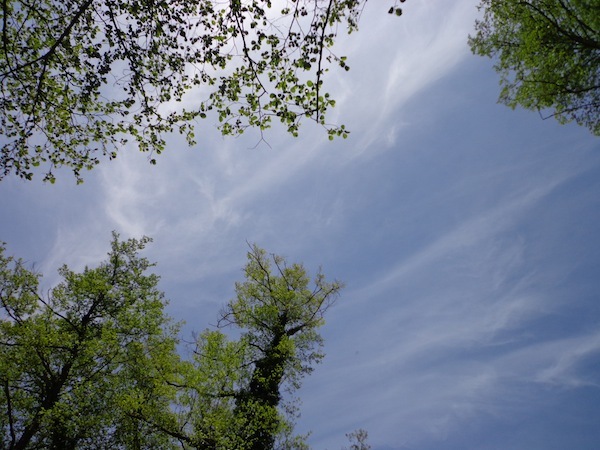 The breeze ruffled the trees as Miss M slept and I set out my picnic, which was now slightly lonelier than it was a few minutes before — a picnic for just one. But still, a picnic in Provence is a picnic in Provence. 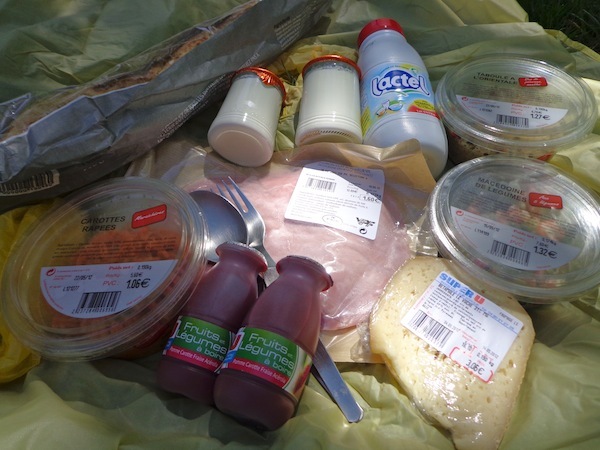 And basic supermarket fare in Provence is fantastic – cheese, ham, baguette, yoghurt and packaged salad. Miss M was, as you would expect, the life of the party. The view from the riverbank was actually pretty amazing. From just about every angle. I watched the clouds drift by and thought about how fortunate I was, to have the independence to travel alone with my daughter, to have the health to cycle 16 kms, to be wealthy enough to travel to France and to be lucky enough to have an Australian passport that allows me to travel just about anywhere. Eventually Miss M stirred and after playing a quick game of kick-around with two little boys and feeding the ducks, we were off again. We didn’t actually make it to the source. The steep gravel road didn’t seem safe — too steep to ride up, too slippery to push a strangely-balanced bike up. I started back. And somehow the day got even better. We retraced our route, alongside fields of wildflowers. We stopped at the Partage des Eaux, where the Sorgue river parts. And there we met a wonderfully friendly family. We spent several wonderful hours with them, an amazing treat for a lonely solo parent. It was so nice to be able to sit for a few minutes while someone else played with Miss M.
And as the light faded, we cycled the short distance home, along the beautiful waterways of L’Isle Sur La Sorgue. Even though we stayed in a camping ground, we weren’t actually camping. We were glamping instead, in a sumptuous two-bedroom tent-lodge. *A flashback post, written in Vietnam a few months after our Europe adventure ended, because I discovered that traveling with a toddler and no co-parent was not conducive to blogging. oh, WHAT a lovely day. yay yay!! Sounds like a lovely day even if it wasn’t exactly how you had hoped it would be. They say the journey of a thousand miles starts with the first step, well it’s the same with cycle touring….. one day, especially one as beautiful as this eventually leads to another. I love that title.. a dream distilled. I think you got the essence of it.